While it’s no secret foodies like farmers’ markets, a new project in Spartanburg, South Carolina wants to attract a different kind of customer: those who rely on food stamps to feed their families. It’s called the Healthy Food Hub, and it’s the brainchild of three local nonprofits who want to transform a place now known as a food desert into an urban oasis for low-income patrons. 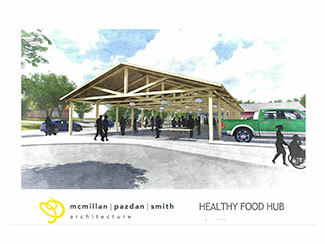 Slated to open this July, the $1.7 million nonprofit development will bring a farmers’ market, grocery store, cafe and a small urban farm to Spartanburg’s Northside neighborhood. It’s an area with a large African American population that’s seen a little development in recent years, but still struggles with with a blight and poverty. While there has been some concern about gentrification displacing residents, Brendan Buttimer, executive director of the Hub City Farmers’ Market, says his group wants the Hub to address the needs of the existing community. The project is a partnership between the market, the Northside Development Corporation and the Butterfly Foundation, a group that provides culinary training to people with economic difficulties. The Hub’s being built with funding from the federal Healthy Food Financing Initiative and a substantial grant from Duke Energy. The project’s roots, however, start with Bill Barnet, NDC’s chairman and a former Spartanburg mayor. Barnet became intrigued with the idea of developing the area, according to Buttimer, after being approached by several Northside residents who asked why nothing was being done to help the neighborhood. Talks between NDC, the Butterfly Foundation and the market to turn a vacant neighborhood field into the Healthy Food Hub began in 2011. Workers broke ground on the project last year. The Hub’s three nonprofit partners have a complex arrangement. NDC owns the land, while the Butterfly Foundation owns the 8,000 sq. ft. market pavilion and a 4,000 sq. ft. building. The foundation will also offer training and tend the store and cafe. The farmers’ market, a tenant, is relocating to the Hub from a nearby neighborhood. In addition to holding regular operations there, it will be growing food on site at a small farm and a greenhouse donated by a local church. The farm, which spans four-tenths of an acre, will consist of several raised beds and a small orchard. Organically grown food will be sold at the store and cafe and through a “mobile market” van. The market will also hold educational events to teach basic gardening and familiarize visitors with a wider range of produce than can generally be found on supermarket shelves. Buttimer hopes the Hub can be self-sustaining in the next three years with money from school tours and sales at the market, store and cafe. He’s not shy about talking about the intended market, either. Although the Hub will be open to anyone, the focus is on drawing neighborhood residents. Buttimer specifically wants to bring in families who receive aid from the federal Supplemental Nutrition Assistance Program, commonly known as food stamps. “We’re really making a big effort to go after SNAP money, because it’s good for public health and it’s good for the local economy,” he says. During the last fiscal year Spartanburg county residents received around $68 million in SNAP dollars, but only about $2,500 are spent at farmers’ markets there during the average year, according to the South Carolina Department of Social Services. The market currently has a SNAP matching program underwritten by the United Way of the Piedmont. They match up to $30 a year with a maximum of $10 a visit. In order to get local residents to the Hub, the nonprofits have been advertising, going door-to-door and working with local churches and agencies to get the word out and overcome doubts about the project.